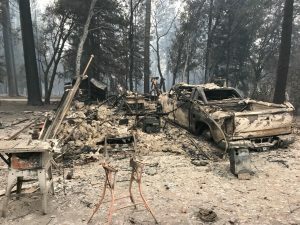 The fire crisis in Butte County, California, left 151,000 acres affected, over 15,573 buildings destroyed, 85 fatalities and 1,200 others missing. Many families and friends of students and alumni lost their homes and businesses. The smell of smoke filled the air that morning. 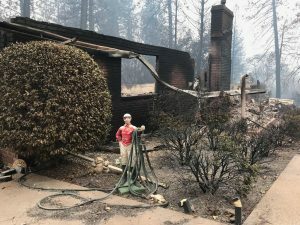 Mikaela McMartin’s mother and grandmother, resting at their house at the heart of Paradise, California, received a call for an immediate and mandatory evacuation. Walking outside their house to load the vehicles, they understood the gravity of the situation. The air turned thick and it seemed as though it was midnight. Cars crashed into each other due to low visibility. “The traffic was bumper-to-bumper and only inching forwards as the flames grew closer and gas explosions surrounded the vehicles,” McMartin said. McMartin’s grandmother and mother drove in separate vehicles, helping others who attempted to flee on foot. As they drove farther, they became separated. Six hours after their last call, McMartin’s grandparents found her mother at the evacuation shelter. She had to abandon her vehicle, and firefighters led her and many others to an asphalt parking lot. 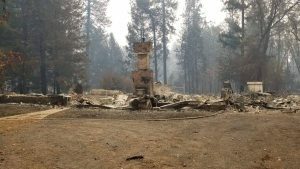 “While the fire surrounded them on all sides, the firefighter sprayed them all with water in attempts to keep them from catching fire from the embers raining down on them,” McMartin said. A bulldozer cleared their path to continue with their evacuation. Sypherd’s 87-year-old grandfather woke up to a loud noise. 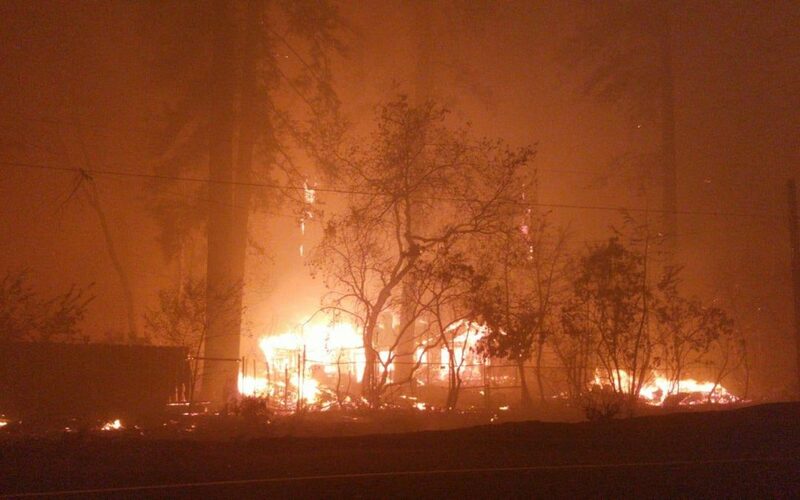 Looking out his living room window, he saw flames heading toward his home. With the power out and the emergency rip cable not working, he panicked. He grabbed his shoes and ran, leaving behind his glasses, hearing aids and socks. Passing by a chapel he helped build more than 50 years before now burning to the ground, he ran far away from the flames where he sat down to catch a breath. Some strangers took him to a safe place where he checked into a hospital and later to a shelter. Thursday, Nov. 8, Jalene Alvies, a freshman majoring in general studies, woke up with many texts and missed calls from her family. “They were safe, but were in a ‘living hell,’” Alvies said. When the fire reached the surroundings of Alvies’ house, someone broke into their home, turned on the water and took away the propane tanks. Alvies never thought when leaving for her first semester that she would never get to see Paradise as it was. The magnitude of the situation, difficult to understand, came as a surprise for many people. 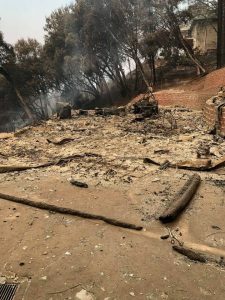 “I didn’t understand how catastrophic this fire was until I started seeing social media posts from friends,” said Breanna Carter, a BYU-I alumna. Carter’s family had to evacuate their home, taking with them a few of their pictures, journals and other family valuables. Her father, working at the other side of town close to the fire, left the office, helping their elderly friend Susan. “He called my mom, fearing it would be the last time he would talk to her,” Carter said. Carter called her 89-year-old friend Irish to make sure he was aware of the situation. She told him to call back when he arrived at a safe place. “The following days were some of the longest, most mind-numbing experiences I have ever been through,” Carter said. She received calls from her family telling her they made it to safe places. However, nothing from Irish. “I felt sick not knowing if he made it out alive.” Carter said. Carter posted a photo of Irish every day on social media searching for him. Four days later, the phone rang. Irish made it safe. There are thousands of stories of people who lost everything they had. Many have created GoFundMe campaigns to help those in need. 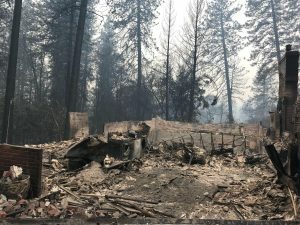 People can help by going to californiavolunteers.ca.gov where they can find information about volunteer opportunities as well as making donations for the people affected by the fires. “Comfort people you know, donate to the victims, try to donate what you can, help house those who lost, help in any way,” said Jaclyn Koger, a senior majoring in international studies.